After two weeks off the bikes, it felt incredible to be back on the bikes... Kind of like coming home. But, we couldn't get too distracted by the bliss, we still needed to make our way out of Lima. 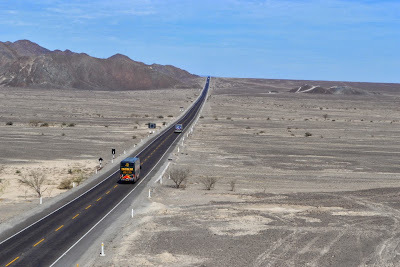 After escaping Lima, this stretch took us along the Panamerican highway through desert, and then some more desert. Fortunately, some sunshine and a powerful sandstorm made this stretch a little more interesting than north of Lima! After our camera was stolen, we were luckily able to buy a new camera in Lima. For camera nerds we are now using a Nikon D3200, let us know what you think. The size of the photos is pretty small for uploading purposes, but we are pretty happy with the results. Our ride out of Lima was a little easier than our ride in. We decided to head down to the coast, which was about 10 km from where we were staying. We were even able to use some separated bike lanes to get there. From there we carried along the coast until we met up with the Panamerican highway again. Traffic got lighter and lighter the further we went and we had a generous and very smooth shoulder... All in all, there was not a lot to complain about. We decided to stop in the town of Chilca, a quiet and friendly place. We stayed at a little family run hotel and restaurant. Although it felt excellent to be back on the bikes, our bodies had softened a little and I certainly noticed a little more aching in the buttocks region. A back pain from an old injury also came back to haunt me in the afternoon, which had me worried for a while... But luckily it was gone in the morning. The sun was actually shining today. It made the coastal scenery so much more beautiful, with golden dunes and crashing waves... Instead of bleak and cold. We were making excellent time, and were shocked to actually have a tailwind, a rarity on the coast. Unfortunately as the day went on I noticed a creaking in my bike, that became more pronounced if I was going downhill. I stopped a few times and couldn't quite figure out what was happening... But finally we found that it was coming from my front hub. It was really really crunchy, which meant that something was not well with the bearings or the cones. We had another 30 km to the next sizeable town so we just carried on. When we got to town we found a cheap place to stay, and headed to the market where the hotel owner said there was a bicycle mechanic. We found the mechanic, who seemed of have a general hardware sort of stand. We showed him what was wrong and he assured us that he could fix it... When we took apart the hub he dumped the bearings out into the sand... I tried to pick them out it examine them, but they were mixed up with all sorts of other rubbish. He quickly put some 'new' bearings in... Although in retrospect we think they probably were not new. Then he put the wheel back on, but incorrectly. All of this was stressing me out a fair amount! When we got the wheel back on correctly, we found that the hub, while better, was still very crunchy. He then took over again and put in some more "new" bearings. It was still crunchy, but rideable so we figured we should cut our losses. Luckily we were also able to find an electrician to fix my bike computer that had come unwired (likely from all the coastal dampness). We were pretty exhausted, so found some dinner and then crashed for the night. We decided to make it a short day and stop in the next city, so that we could have my hub looked at again. We still had some tailwinds, so the ride went quickly and we arrived in town early afternoon. After finding a place to stay we found the bike shop sector of town... A whole block of shops and stalls. Unfortunately, nearly all of the mechanics were on lunch. The only one we could find had a small stall and when we first explained the problem, he felt the hub, looked at us and said "what's the problem". We explained it again, and then he seemed to understood and took the wheel off and start taking apart the hub. I got a little panicky....not wanting to have a repeat of yesterday's performance, especially since he thought the wheel was perfectly fine at first. But, he quickly saw that the wrong bearings had been used along with unnecessary dust caps. Then he put in some new (from a package!) bearings and quickly put it back together properly. After this, I felt much better and the wheel was rolling nicely as well. Phew! We spent the rest of the afternoon resting and had a sandwich picnic in our room for dinner. We decided to take a detour to the touristy town of Paracas. Normally we avoid places like this, but there was a a huge national reserve beside the town that we could explore on bike. So our plan was to take the next day off to bike around the park and hopefully see some interesting wildlife. It was about a 12 km detour with a strong headwind to get to the town, but when we arrived it was sunny and deliciously warm. After some time we found a place to stay for a reasonable price, and we settled in. We made our own supper as just about every restaurant in town was way out of our price range... Then it was early to bed. We woke up late and decided to take advantage of the sunny weather, and doing our washing as our clothing would having a chance to dry out. As we were hanging up our clothing, one of the hotel workers told us that we should take our cloths into our room a little later as the 'lluvia de arena' was coming later. We had seen this phrase, which translates literally as 'rain of sand', around town. There was even a restaurant called Lluvia de Arena.... Not too appetizing. We didn't take the workers warning too seriously... As it had been windy the day before, with the occasional cloud of sand blown across the road. We decided to head into the park on our bikes, and take our chances with the clothing. When we got onto the main road into the park we realized the the wind was a little more intense than yesterday.... We struggled against it for several kilometres, and then decided to turn back... It was supposed to be a day off after all. When we got back to town, the wind was howling and sand was beginning to fill the air. We brought our clothing inside the room and hung out for a while. When I went back outside everything was covered with sand. For the next few hours the wind got stronger and stronger and sand started to creep through every crack into our room. By 5pm, the worst of it was over and people began to emerge and begin the clean-up. The hotel owner said that this only happens once a year. We were glad that it was not a travel day for us. It was still a little hazy as we left Paracas... And continued this way most of the way to Ica. But the ride was fast. A tailwind helped us make our way up a very gradual climb to the town of Ica. The whole region around Ica is extremely fertile, helped out by a lot of irrigation. It is an up and coming wine producing area, so we past field after field of grape vines. It was quite stunning to see such green against a back drop of sand dunes. We arrived in Ica early afternoon and then made our way to the neighbouring town of Parcona where we had a warm showers stay arranged. Berly was not home when we arrived at his house, but he showed up about an hour later. He welcomed us into his home and gave us a huge room along with use of the kitchen. We chatted for awhile and then he left us to settle in. Unfortunately we didn't see him for the rest of the night, as I think his room was on the bottom floor of the building. We cooked a nice dinner and had a quiet evening. When it was getting to be time to find a camp spot we were in a particularly flat and featureless stretch, that continued for as far as we could see. The chances of finding a hidden spot to camp were very small. When we came across a small farm, we decided to stop and ask if we could camp there. The caretaker was very kind and gladly offered us a place behind his house. He quietly finished up his work for the day, while his dog looked at us suspiciously and barked until it got bored. We made some supper and went to bed soon after it got dark. It was nice to wake up with the sun and in our tent. We made our usual breakfast of oats and coffee and hit the road. Today was a little hillier than the last few days, we are getting closer the Andes once again. It was also hot, as we are far enough from the ocean to avoid the cool wind, but not high enough in the mountains. We are lucky we are here in the winter months, apparently in January it gets up to 45 degrees regularly. We pushed along through the heat, and eventually arrived at the famous Nazca Lines. These are a series of lines and figures that stretch over 500km2, there of figures that include a monkey, birds, a tree, hands etc. The strange thing is that they can only been seen from above, and they are thought to have been created by the Nazca people over 1500 years ago. It is still a mystery what exactly their purpose was. The best way to see them is to take a flight overhead, but at $50 a person we would not be taking a flight. The second best way is to climb a rickety old tower for about 30 cents a person, and see a couple of the figures... So we did that. We still had another 25km into town, so we carried on. We eventually found a resonably priced place to stay and settled in. We took another day off to rest up and get organized for our next leg, which will take us to Cusco. It should be quite a challenging stretch, as we will have four passes over 4000 metres in about 650 km. We are estimating that it will take us between two and three weeks to get to Cusco. Wish us luck on the long long climbs!